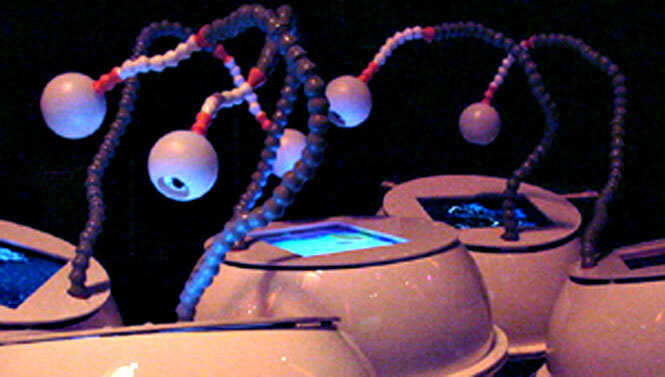 The Introspection Machine (1999-2000: Aesthetics and Computation Group, MIT Media Laboratory) is an interactive environment for visual feedback. The machine consists of multiple modules, each of which has a screen display and a flexible, manipulable "eyestalk." Each module transforms the video image from its eyestalks into a supple and organic dynamic display. By redirecting these eyestalks, users can explore an unbounded space of continuous light, complex forms, and surprising relationships. The machine's reconfigurable eyestalks comprise the principal interface by which participants interact with the installation. These playful stalks, which pipe light from computer to computer, make it possible for the video output from one reactive display to be used as the input for another. An Introspection Machine module may also be piped back to itself, creating a tight loop of visual recursion. As visual material from each display is reinterpreted by the others, light patterns shift and mutate based on the connections, configuration, and movement of the stalks. As a complex feedback system, the Introspection Machine has analogies to a wholly visual network, whose cybernetic intelligence is derived from the principle of visual feedback. The Introspection Machine was a group project created by the MIT Aesthetics and Computation Group for the Art Gallery at Siggraph 2000. The five computers used to run this installation at Siggraph were generously donated by the Intel Corporation. More information about this project is available at the Introspection Machine web site. Flurry (2000) is one of the interpretive video systems I designed as one of the software modules of the Introspection Machine project. 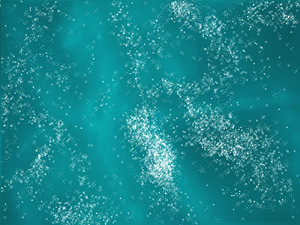 In Flurry, graphic particles move towards areas of low change in the video image. When placed into a visual feedback with itself, Flurry's moving particles themselves become the agents of change.